An inmate at Rio Cosumnes Correctional Center in Elk Grove, Calif., in May. California is under a court order to reduce prison crowding by tens of thousands. The U.S. Supreme Court refused Friday to let California delay the release of thousands of inmates from state prisons to relieve crowding. In June, a lower court ordered California to release about 10,000 inmates — nearly 8 percent of all state prisoners — by the end of the year to improve to improve medical and mental health treatment. Gov. Jerry Brown last month asked the Supreme Court to delay the order, arguing that it would jeopardize public safety. Justice Antonin Scalia, joined by Justice Clarence Thomas, strongly dissented with the high court’s 6-3 one-sentence order Friday, predicting a wave of murders and rapes in the streets of California. Justice Samuel Alito also disagreed but didn’t join Scalia’s dissent. California Gov. 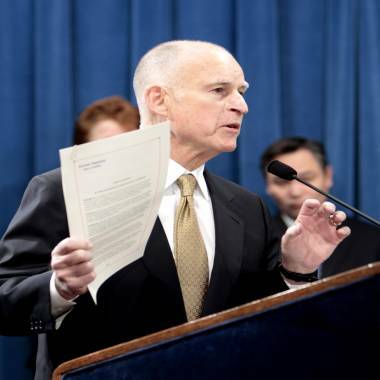 Jerry Brown, pictured at a news conference in Sacramento in January, called the Supreme Court’s order dangerous Friday. The legal issue was Brown’s request for a stay of a ruling by a three-judge panel of the U.S. District Court for Northern California ordering the state to release about 9,600 inmates in the short term as part of larger proceedings requiring it to reduce its prison population by about 30,000. The state argued that it had made “meaningful progress” by transferring thousands of “low-risk” inmates to county and local jails. Scalia and Alito agreed with that argument. Mike Bien, a lawyer representing inmates in the case, told Capital Public Radio of Sacramento that the decision was significant because it appeared that Brown was gambling everything on his request for a stay. The state had already taken steps to start moving some inmates out of state, releasing more low-risk inmates and expanding parole programs — actions it said it was taking under protest.